Babyalpaca Wool is one of the most exclusive wools in the world. It is ultra light, shines like silk and seven times warmer than other wools. 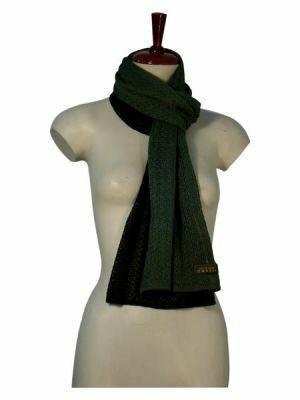 An exclusive and fashionable scarf made in a trendy design and with a unique natural material. The alpacas are the most numerous of the South American camelids, with a population of approximately 3.5 million in the Peru (about 75% of the world total). The alpaca is usually 1.20 m to 1.50 m in height, and weighs between 45 kg and 79 kg. It has a smaller and more curved profile than the llama and has a distinguishing fringe of hair on its forehead. There are two varieties of alpaca: Huacaya and Suri. The Suri has long, straight hair which is silky and exceptionally lustrous. The Huacaya is the more numerous type in Peru, representing 93% of the population, and has relatively short fiber which is dense, curly and voluminous. The hair covers almost all the body, only the face and lower parts of the legs having a covering of short fibers. The alpaca, in its two breeds, the Suri and the Huacaya, is the source of a beautiful fiber, of exceptional brilliance and extraordinary texture, whose fineness varies from 19 microns (Royal Alpaca) which is very rare, 22.5 microns (Baby Alpaca), 25.5 microns (Super Fine Alpaca), to 32 microns (Coarse Alpaca). This unique fiber also offers the largest range of natural colors in the world, which vary from black to white, and extend through an ample range of grays and browns. The names of these qualities do not necessarily reflect the age of the animals or other phenotypical characteristics. The appellation 'Baby', for example, is applied to products (tops, yarns, cloth, etc.) where the average fiber diameter is 22,5 microns. The fiber used to obtain this quality does not necessarily come from baby animals; it could easily come from an adult animal with a very fine coat. Each quality is employed to create different products such as cloth, scarves, sweaters, blankets, carpets and so on. The alpaca may also be blended with other fibers, generally of natural origin.